How do you capture the look and feel of Spain without having ever been there? This was the challenge director Rouben Mamoulian had working on Twentieth Century Fox's new big budget movie about a Spanish bullfighter. He had to make Mexico City and stage 5 of Fox Studios in Los Angeles transform into Spain on screen. Mamoulian looked to the art of great Spanish painters of El Greco and Goya for inspiration. He worked with his cinematography team consisted of Ernest Palmer and Ray Rennahan to recreate Spain and translate into Technicolor splendor. The result was Blood and Sand (1941). "One can't build on sand." Juan "Juanillo" Gallardo (Tyrone Power) is a born torero (bullfighter). The son of a slain matador, Juanillo begins his bullfighting career at a very young age despite the desperate pleas of his mother (Alla Nazimova). Without the ability to read or write, he has few options left to him. He defends the honor of his father to loudmouth journalist Natalio Curro (Laird Cregar). 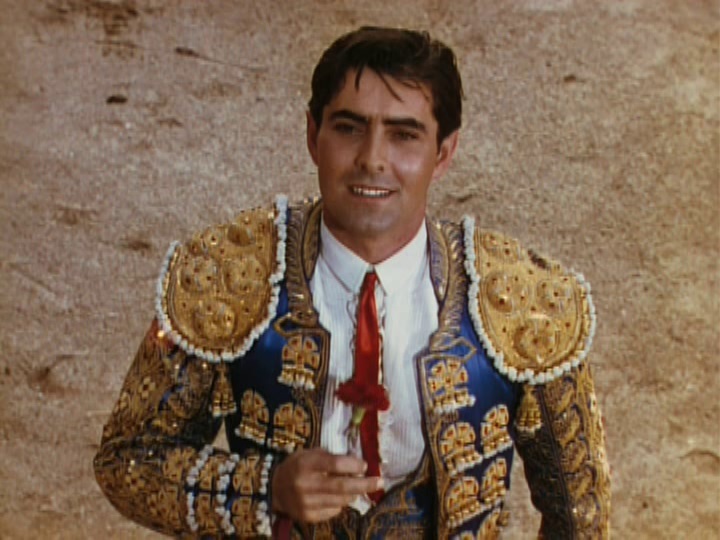 After the incident, young Juanillo gathers his cuadrillo (group of friends) and sets out to Madrid to become real matadors. Years later Juanillo comes home with his cuadrillo including El Nacional (John Carradine), the reluctant fighter who doubts the merits of the sport, and Manolo (Anthony Quinn), who thinks himself a better fighter than Juanillo. 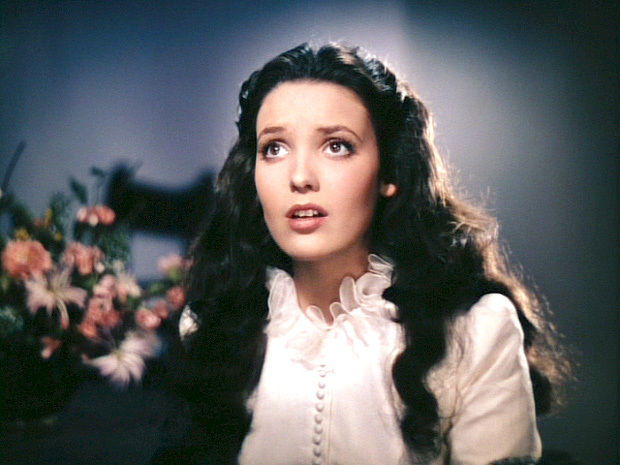 After their return Juanillo seeks his childhood sweetheart Carmen (Linda Darnell) for marriage. As he becomes recognized by many as the best matador in Spain, wealthy socialite Doña Sol (Rita Hayworth) attends one of his fights and the two begin an affair. And so begins Juanillo's downward spiral in his quest for glory. 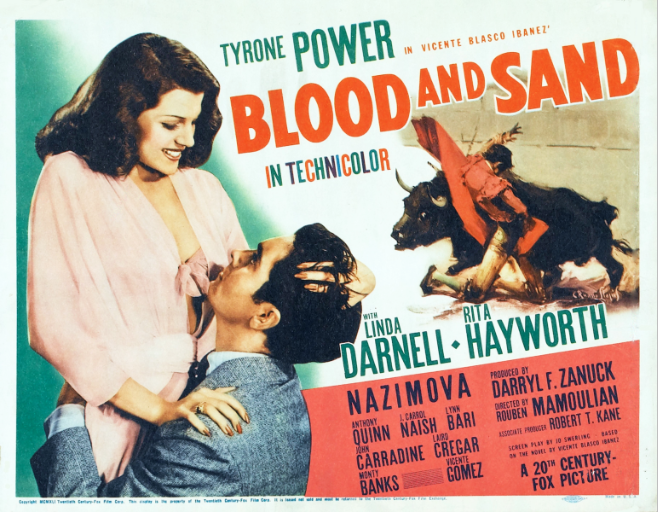 Produced by Darryl F. Zanuck, Blood and Sand explores the various aspects of bullfighting as a sport and as a culture. Audiences get to see the many facets including fame, finery, rituals, pomp and circumstance, publicity, beautiful women, cuadrillos, familial despair and religion. The exotic and dangerous world of bullfighting lends itself to an exciting story. What's interesting about this movie is that it doesn't fully glorify this controversial sport. We see social inequality and injustice and brutality. Through John Carradine's character El Nacional we hear the voice of doubt. In 1941, Tyrone Power was a Fox contract star at the top of his game and Blood and Sand was a great film to keep that momentum going. He was well-suited to the role of a matador as he could exhibit the screen charisma and physicality required for the story's complicated hero. Also it doesn't hurt that Power was one of the most handsome leading men in Hollywood. It seems realistic that he'd catch the eye of two women as beautiful as Linda Darnell and Rita Hayworth. And those two actresses play the perfect polar opposites: Darnell as the sweet, dutiful and religious wife and Hayworth as the bored, lusty socialite. I enjoyed Darnell's performance but thought Hayworth was a bit over-the-top as a temptress. There was too many instances of eyebrow arching and not enough subtlety for me. I usually enjoy Hayworth's performances so this is definitely a one off. After the success of The Mark of Zorro (1940) starring Tyrone Power and Linda Darnell, the swashbuckling remake of the Douglas Fairbanks classic, Fox was raring for a good follow-up. So they dipped back into the silent film well and found another story. 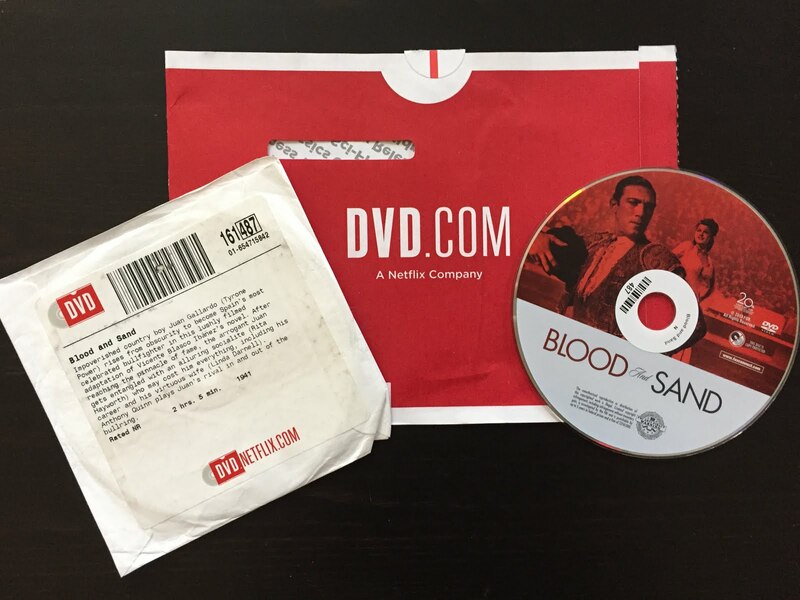 Based on the 1908 novel by Vicente Blasco Ibáñez, Blood and Sand has been adapted for film several times. It was originally a Spanish film released in 1917, then released as a silent movie starring Rudolph Valentino in 1922 before it was adapted again in 1941. 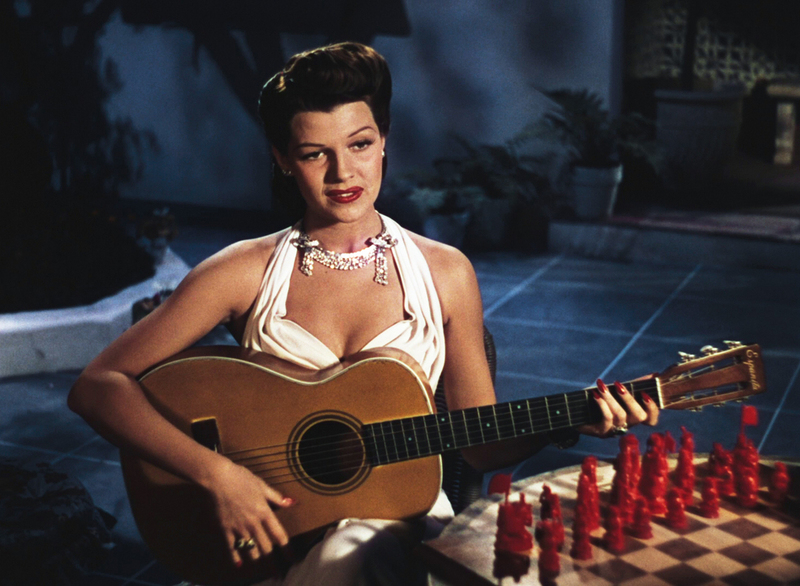 Fox considered adapting it in 1957 with Sophia Loren in Rita Hayworth's part as Doña Sol but project fell through. Another adaptation came in 1989 starring Chris Rydell, Sharon Stone and Ana Torrent. Years later when Mamoulian visited Spain for the first time he said "I was most pleased to discover it looked exactly the way the Spanish masters had painted it and that it was as I had imagined it would be. People in Spain who had seen and loved the film did not believe I had never visited the country before making the film." At the Oscars in 1942, Blood and Sand was nominated for Best Art Direction-Interior Direction and won for Best Cinematography, Color. Tyrone Power, John Carradine, Anthony Quinn and others were taught the art of bullfighting by champion Mexican matador Armillita Chico. Armillita was also Power's double in some of the bullfighting scenes. Power was also taught by a young aspiring American matador Budd Boetticher who worked on Blood and Sand and went on to direct westerns. An extended version with additional bullfighting scenes was distributed in South America. I wasn't quite sure what to expect from Blood and Sand. It's not the type of film I tend to gravitate towards. I was pleasantly surprised how much I enjoyed it and how multi-layered the film turned out to be. I appreciated that it wasn't a glorification of bullfighting rather it showed many elements of this both celebrated and hated sport. Blood and Sand (1941) is available to rent on DVD Netflix.